Tooth discolouration affects your appearance and the way you communicate. It can make you feel conscious about the way your teeth look, making you reluctant to smile or talk. Brushing alone does not totally restore the natural colour of your teeth. Garden View Dental Care offers effective treatment to make your stained teeth a few shades whiter in less time. 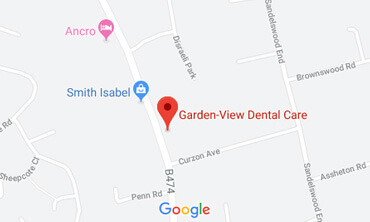 Visit Garden View Dental Care for an initial consultation. We are the premier provider of teeth whitening treatments in Buckinghamshire. Depending on your situation, we can either perform a procedure in our practice or provide a whitening kit that you can use at home. Our tooth whitening services in Buckinghamshire are available at the most competitive rates, allowing you to get the results you want without going over budget. Check our Fee Guide for complete pricing information. Have Whiter Teeth. Smile Confidently. Your journey towards achieving a beautiful smile starts here. An initial consultation is necessary to assess your needs and determine the right treatment. Come to our practice and our friendly staff will welcome you with a smile. There is no need to be afraid; our dentist will make you feel comfortable throughout the treatment process. Our goal is to help you achieve a brighter set of teeth, regain confidence and live life to the fullest. In addition to providing effective treatment solutions, we share some tips on how to ensure long-lasting results and prevent tooth discolouration. Make Garden View Dental Care your trusted partner in achieving better oral health. Contact us today to request an appointment with our cosmetic dentist in Buckinghamshire.